Fortunately there is a perfectly legal way around this tax – buy a 30 year old car. Unlike most makes of car, a 30 year old Mercedes, if it has been well cared for, will still be a fine and practical car for every day or special occasion use. 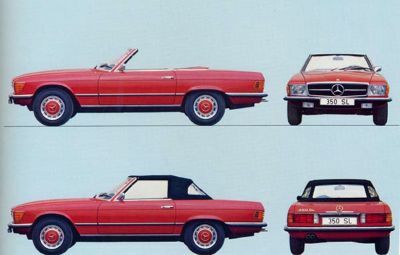 A popular classic Mercedes model of this age is the R107 280SL, 350SL and 450SL roadsters, which were built from 1971 onwards. With minor upgrades this model was produced until 1989, which shows how advanced it was at the time. It takes an experienced eye to spot the difference between a 1971 and a 1989 example. Other popular choices are the W123 saloons, coupes and estates, the W108 S class saloons and the W111 coupes and cabriolets. Most of these cars have succumbed to the ravages of time now, but there are a few that we come across which have led a cherished and sheltered low-mileage life as a second or third car and someones pride and joy. These are the cars we seek out. Please call us if you would like to purchase such a car. For Irish customers wishing to view cars we can meet you off your flight at Manchester airport, and for a reasonable fee we can deliver your new purchase to the ferry terminal at Holyhead, which is a two hour drive from us, or all the way to your home.